Burgers and beer. Seriously, could a place be more perfect for me? If I played that stupid game where I was stranded on a dessert island and I had to choose a limited amount of things to take with me, burgers and beer would be two of those things. We weren’t planning on making a trip to the Chicago area this past weekend, but my brother needed to bail on a trip he had scheduled with my dad. They had tickets for the White Sox game on Saturday and a series of events made it difficult for my brother to keep his commitment. Not wanting to disappoint my dad, he called and asked if I would go with him instead….and it’s hard for me to turn down free baseball. The night before, my mom asked if we’d come to their house for a little bit. It’s easier for us to stay at J’s parents because they’re in the Chicago suburbs and therefore, closer to Kalamazoo. My parents live about another hour or so south, so we don’t get there as much as anyone would like us to. When J got off work at noon on Friday, we packed up the car and headed south. We got to my parents fairly early in the afternoon, so J took a nap while L and I went to the park with my parents. We let J sleep a little while longer after we got back, but then it started creeping towards dinner time and L and I were getting hungry. My aunt had given me a gift card for Burgers & Beer in Kankakee for Christmas. We don’t get back that way often anymore, so I had still had it in my wallet. I asked if that’s where everyone wanted to go for dinner and no one objected. 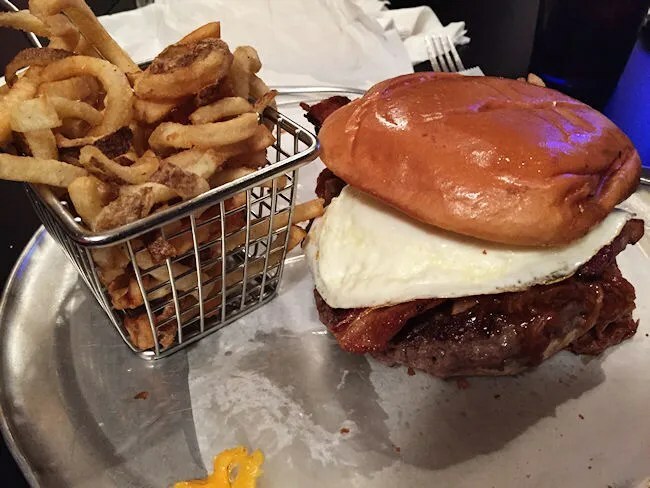 Burgers & Beer is kind of an oddity in the Kankakee area. The places I grew up were not and still aren’t really craft beer minded. They prefer their 30 pack of Busch Light and drinking a Budweiser is what separates the boys from the men. Burgers & Beer is trying to break that mold and so far, is succeeding where other places haven’t. 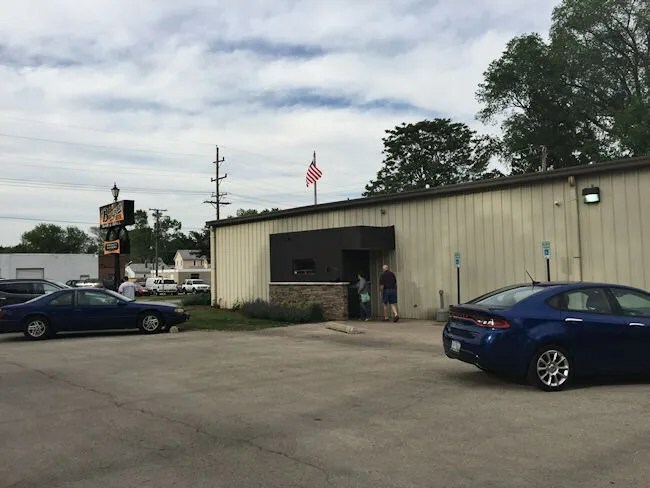 The unassuming restaurant on Kankakee’s south side looks more like a warehouse than a dining establishment. It’s a large Morton type building with no windows. It actually used to be a VFW Hall. From the outside, it looks awfully big, but once you get inside the actual dining room, you’ll see looks can be deceiving. My brother and aunt decided to join the five of us for dinner, so our total party was seven. We got there about 30 seconds too late. There were two tables open that could have been pushed together when we got there, but one of those tables was being seated as we walked to the hostess stand. It turned out, we had to wait about 35 minutes for two more tables to open up together so we could all be seated together. While we waited, I went to the bar to get a drink. They have a fairly large beer list with a lot of year round options. I didn’t notice a lot of specialty brews on the list and not as many local ones as I would have liked. 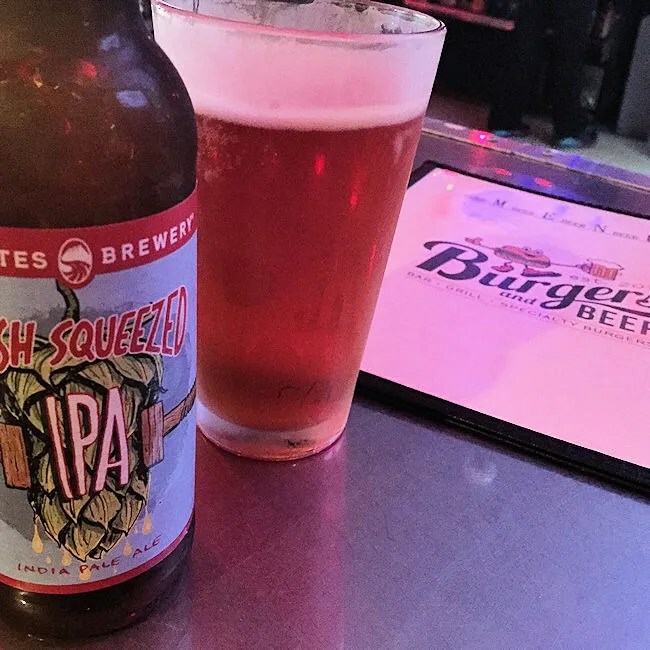 I ended up ordering a Fresh Squeezed IPA from Deschutes Brewery. I’ve had this one available to me before, but have never actually drank it. It popped off the list at Burgers & Beer to me because they highlighted that it’s made with Citra hops. That got me on board and gave me something to sip on while we waited for a table. Once we were seated, I grabbed the beer menu again. 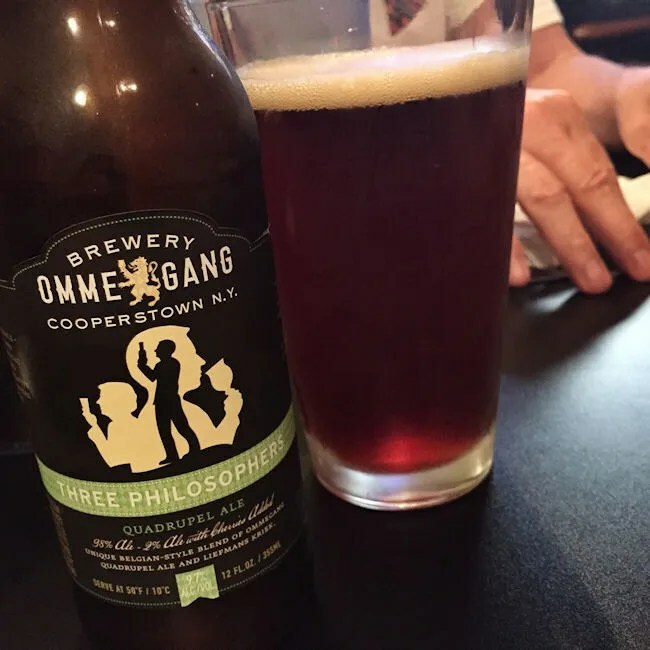 This time I ordered a Three Philosophers from Brewery Ommegang. I like drinking quadruples with a hearty dinner and this one did not disappoint. The rest of the table ordered either Pepsi products or stuck with water. Once again, I was the only one drinking delicious beer. Obviously, Burgers and Beer’s main menu items are the burgers. 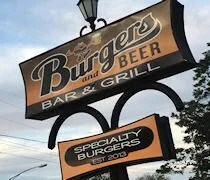 They have a huge selection of specialty burgers plus the option to create-your-own if you can’t find anything that sounds good. First things first though, we started with a couple of appetizers. We’d been waiting a while and everyone was pretty hungry, so we ordered the Bleu Fries and a Stuffed Pretzel. The Bleu Fries were incredibly delicious. They were steak fries topped with bleu cheese crumbles and bacon then served with a side of bleu cheese dipping sauce. These went pretty fast as J, my brother, and I all really like bleu cheese. 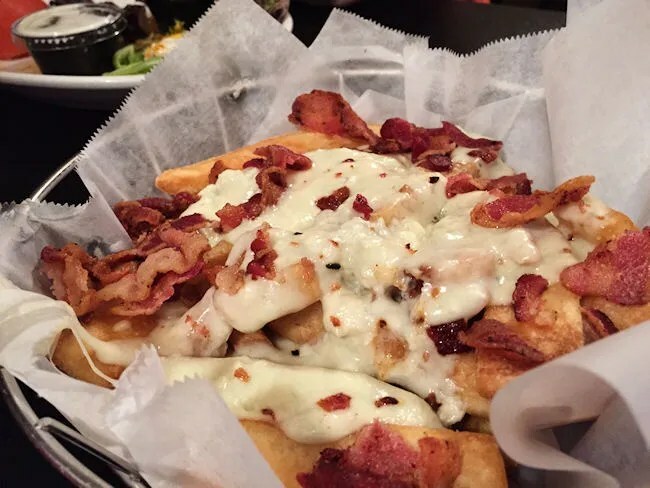 All of the fries were covered in cheese and bacon, so there was no chance any of us would choose just a plain fry. The Stuffed Pretzel was huge. My mom though this one sounded good and ordered it mostly for herself, but to everyone’s surprise, L really liked. 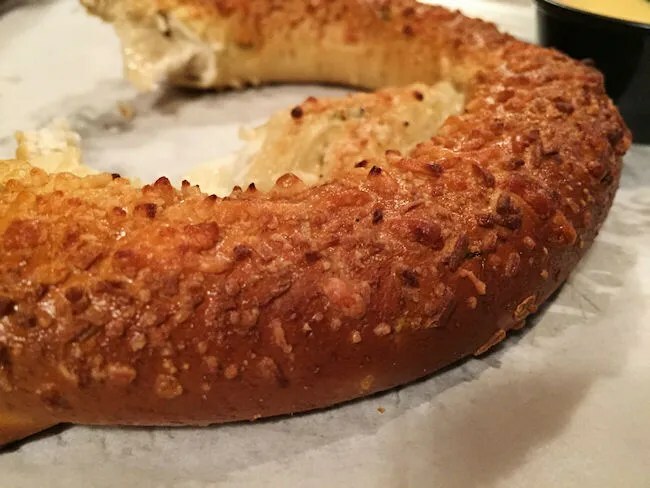 The pretzel is filled with jalapenos and cheese and comes with a cheddar dipping sauce. It was pretty spicy, yet the three year old kept asking for more. She even passed on the fries to get more of the pretzel for herself. I ordered the Mac Daddy. Surprisingly, this one didn’t have any mac-n-cheese on it, but it did have pulled pork, a fried egg, and bacon. It was also supposed to come with jalapeno and onion straws, but I really dislike onions and it’s not a case where I could just get the jalapeno straws and not the onions. They are mixed together and couldn’t be separated. The burger is a 1/2 lb patty served on a brioche bun. My brother and I were just talking about how the fried eggs typically come cooked on burgers like this. He said he can do a well done egg, but not one with a runny yolk. He wouldn’t have liked this one. I took a bite and the yolk went squirting out the back and all over my hand. I really don’t care if the yolk is runny or not. In fact, I typically like it that way. I liked it on this burger as well, but damn, I burned my hand on the backfiring yolk. The pulled pork on the sandwich was pretty delicious although I found the combination of pork, BBQ sauce and the egg a little odd. All of them were delicious in their own right I’m just not sure how much I liked them all together. It would not stop me from ordering the burger again. J strayed from the burger section and ordered the Smokin Q. 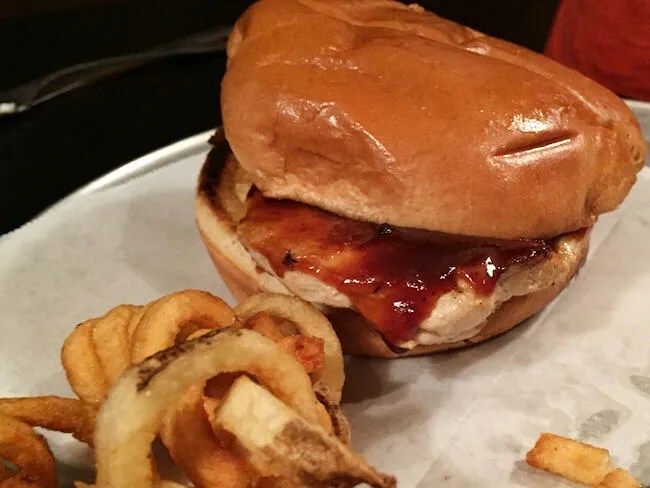 Again, the sandwich is served on a toasted brioche roll and she chose grilled chicken which came topped with BBQ sauce, caramelized onion, and pickles. The chicken was a little too thick for her liking, but she said it was still tasty. The way she puts it, she doesn’t like working to eat chicken and while flavor wise, it was delicious, she would have preferred a smaller, flatter chicken breast. L had her choice of chicken nuggets or a grilled cheese and she chose the grilled cheese. 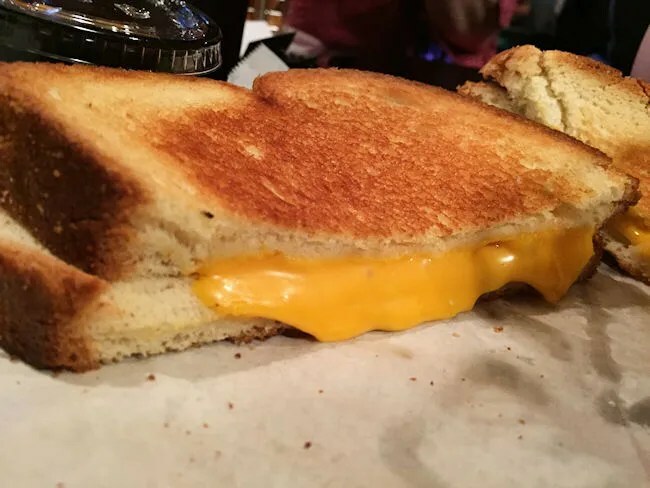 The sandwich had that perfect, buttery, golden brown crust and a lot of gooey, melted cheese. L did a pretty good job filling up on pretzel before it got there so she only ate about half before switching over to french fries. Both my mom and my brother ordered the Hot Mess. We’re back to the burgers with this one and it comes topped with caramelized onions, BBQ sauce, and cheddar cheese. This one is called Hot Mess for a reason. Both cut the sandwich in half and tried to attack it that way, but neither were success in not creating a giant mess. My dad ordered Saucy. This burger is kind of like a pizza. It’s topped with pizza sauce and provolone cheese. He said it was good, but there wasn’t a whole lot of sauce on it. He would have liked for it to be a little more messy. All of our sandwiches came with the choice of side. J opted for the side salad and asked for balsamic dressing but got French. She ate it anyway. She was hungry at that point and didn’t feel like tracking down a waitress. The rest of split on our fry choices. Half got the fresh-cut crazy fries while the other half chose the steak fries. I wish I would have ordered the steak fries after eating a couple of my mom’s, bu the crazy fries (curly fries) were actually quite delicious as well. It’s just a personal preference on how much potato you like your fries to be. The bill for the seven us ran a little over a hundred dollars and that was AFTER they added 18% gratuity even though we only had seven in our party. The menu states gratuity is added for parties of eight, but again, we didn’t feel like arguing because we had already spent a lot of time on dinner and J, L, and I still needed to drive back to the Chicago suburb. In reality, adding the gratuity probably hurt the waitress. My family typically tips 20%, but everyone was a little pissed off they added the gratuity, so we left it at 18%. Burgers and Beer has a lot going for them. From a strong craft beer list to delicious food everyone will find something they enjoy. Waits may be long on weekends, but in the end, there’s not many places in Kankakee to get a beer that isn’t massed produced and fresh, delicious burgers in one place. J and I don’t live anywhere near there, so return trips are not likely for that reason. As for the rest of my family, I think they were pretty turned off by the added gratuity. The feeling they got was that the bar was afraid we were going to stiff the waitress because of the wait, so they added a gratuity. My hope is they just miscounted.